Today we are going to show some more impressive and funny notepad tricks, as we already posted "collection of cool and funny notepad tricks" in past which was 4 tricks, so today i decided to share some more notepad tricks with you. 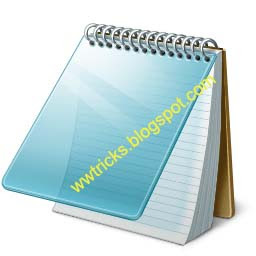 Notepad is not just a text editor but has also plays an important role in many tricks. As we posted a "trick to speed up system using notepad" and how to lock or protect a folder using notepad. Their in this post we have a collection of some notepad tricks so read this may be you don't know about it. With this Notepad trick you can make your system to speak something"that you typed in the code below". So type the below code in and save it as NAME.vbs. speaks="Welcome to your PC, your username"
change the colored text with your own.and double click on "name.vbs". wshshell.sendkeys "This is a Virus. created by wwtricks." Update: send this as an e-mail attachment to have a good fun with your friend. 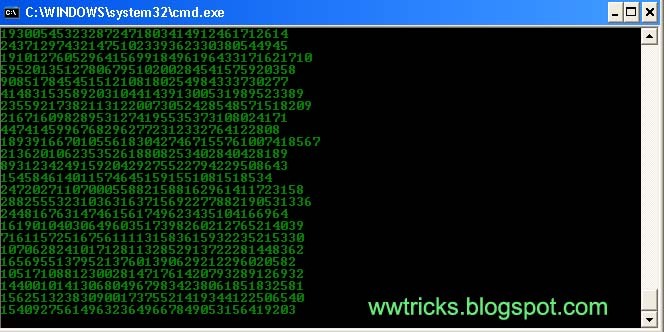 Just type the below code in your notepad and save it with the extention of .bat i.e "wwtricks.bat"
After saving just click on the file "wwtricks.bat" and you will see the coding falling down on your pc. This is another very funny and impressive trick using notepad. By this trick you can impress your friends and make it fool by creating harmless funny virus. Just copy the code given below and paste it to your notepad and then save it as @wwtricks.Vbs then double click on this file and keep your eyes on your cd/dvd rom.